Some folks on Twitter have been having a laugh about these PowerPoint slides from the North Central Texas Council of Governments. “The program is designed to encourage planning and foster growth and development in and around historic downtowns and Main Streets, infill areas, and along passenger rail lines and at stations,” COG explains on its website. 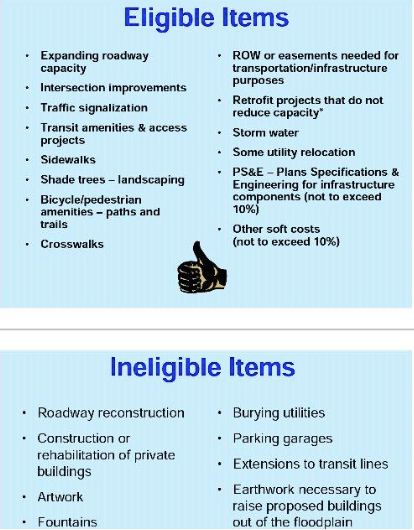 Notice how the top eligible item is “expanding roadway capacity.” And that road reconstruction — maintenance projects — is ineligible. Even though we’ve singled out Dallas here, lots of agencies give out federal “Congestion Mitigation and Air Quality Funds” for road widenings. Adding turn lanes is a federally eligible use. Point being, the federal government and many regional governments — Dallas among them — still accept the idea that widening roads will reduce congestion and thus improve air quality, despite all the evidence that it does the opposite. “Expanding roadway capacity” is considered sustainable and “extensions to transit lines” isn’t? That in a nutshell is what’s wrong with traditional transportation policies. What are they thinking? NCTCOG has used this grant program to build thousands of units of TOD along DART lines. It just so happens that the grant program was broad enough to do TOD back when it was unpopular, as well as sprawl now that it is unpopular. It goes both ways.